You and your family (and that includes the kids too!) must be the alpha dog in your pack. Let this slip and behavioral problems such as growling, challenges and biting may follow. Learn how to teach your pet his place in your pack and reinforce your role as top dog! 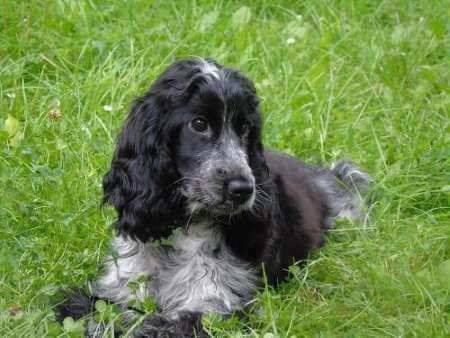 Whilst reading this article, please bear in mind that setting and enforcing these recommended guidelines and boundaries for your Cocker should be done gently and kindly. No rough stuff. Alpha dog training isn't about control or power. It's not about fear and intimidation either, but about teaching your dog 'manners' and helping him to fit into our human world. It's about improving his life as well as yours! An alpha dog is the leader of an animal pack, but this role isn't necessarily held by the male; there are many alpha females leading packs too, just like in our human world! In the domestic household however, the alpha position should always be held by a human, especially if you want an easy life! Who's the boss in your household, is it you, or is it your Cocker Spaniel? Consider this question carefully and be honest with yourself, are you really top dog or is 'Mr Bossy Britches' ruling the roost? If your pooch is the alpha dog, or thinks he is, then you may be heading for trouble and will need to do something about it! If you're not exactly sure who is top dog, read on to learn more about the traits of an alpha male. The Alpha Dog Calls The Shots! Basically, the alpha male is the one who 'calls the shots' and as I've already mentioned, that should be you, not your Cocker Spaniel! Your pet needs to understand that you are the leader of his pack and his place in the hierarchy is below you and your family, and that includes all children, even babies. If there are other dogs at home they'll probably settle their own hierarchy between themselves, so long as they understand and accept where you and your family are placed in that hierarchy. 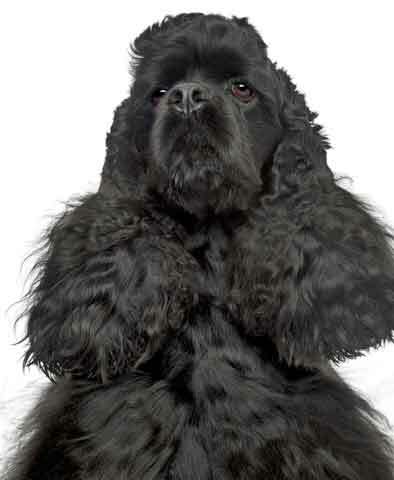 It's important to show your Cocker Spaniel that you are the alpha dog (right from the early days) because if he sees a weakness in your leadership he may try to challenge you for the role. If your Cocker isn't unsure of his status within the pack he may become unsettled, anxious and frustrated. And it's this frustration and anxiety that can lead to undesirable alpha dog behaviors such as growling and snarling, food aggression, resource guarding, air snapping or snapping at fingers, barking, and because your 'pack leader' won't be able to protect you while you're away from home, he may also develop separation anxiety. 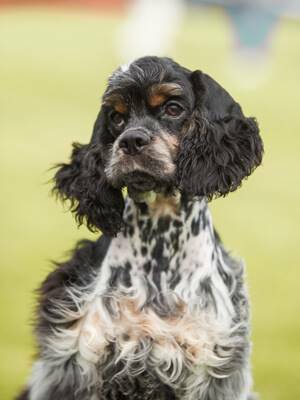 If your Spaniel begins to show alpha dog behaviors you could be heading for trouble. If you notice any alpha traits developing in your puppy (or worse, your adult Cocker) you need to take remedial action, otherwise your dog may learn that his behavior knows no bounds! If your pet is becoming aggressive, or has bitten someone, be sure to seek the assistance of a qualified canine trainer or animal behavioral therapist. Do not attempt to remedy aggressive dog behavior yourself. There are many ways in which you can help to regain and/or reinforce your role as the leader of the pack. Follow these rules consistently and there'll be no confusion; your Cocker Spaniel will understand that YOU are the 'ALPHA DOG'. There are some trainers that recommend the 'Alpha Roll' to keep dominant dogs in check. I do not. NEVER, EVER, perform the 'Alpha Roll' on your dog. It's where the dog is rolled onto its back and forced to stay there. Not only is it outdated and cruel it's extremely dangerous too as it can make your dog fearful of you and cause him to bite. Dogs need to satisfy their instinct to run with their pack. You and your family are your dog's pack and one of the most effective ways to reinforce your role as alpha dog is to take your Cocker Spaniel for plenty of walks. First of all, you decide when and where you walk - not Fido! Walk him on his lead for an hour each day. You can allow him a little daily off-lead freedom when he can run through the woods or fields, or you can throw a ball for him in the park. Don't allow your Cocker Spaniel to walk ahead of you - leading is what pack leaders do! Don't allow him to pull on the lead; your Cocker should walk to heel, quietly and calmly. Sometimes easier said than done when you've an enthusiastic Cocker Spaniel! I don't like using an extendable lead as I don't feel they give you the control over your dog that you need. Besides, if you're the pack leader, and you don't allow him to walk ahead of you, you won't have any need for an extendable lead, will you! While he's on the leash, don't allow him to wander from side to side, sniff the ground, or mark his territory until it's convenient for you. Your main goal here is to keep your Cocker focused on his walk and keep him by your side, or slightly behind you, and by walking him each day, you're not only satisfying his basic need to migrate with his pack, but more importantly you're also reinforcing your status as the alpha 'male'. Another alpha dog trait is for the leader to control when the pack eats, so whether you feed your Cocker once or twice a day, it's best to feed him at a regular time each day and not when he 'demands' it. If your dog is food guarding, you may need to change the way you feed your pet until his food aggression is resolved. You decide when it's feeding time - not the other way around! The alpha dog always eats first, so you should always eat before your Cocker. Whilst this may not always be practical, you may be able to 'con' him into thinking you're eating first by trying a little 'role play'. Place a cracker next to his bowl as you're preparing his meal, then eat the cracker. Even better, pretend you're eating the cracker from his bowl. Don't be tempted to feed your pet scraps from your plate while you're eating at the dinner table. Instead, any scraps should be put into his food bowl and fed to him at him at his normal feeding time(s). An alpha male always leads the way, so never allow your pet to walk through a doorway before you. The same applies to going upstairs. If your pooch rushes through a doorway before you, call him back and make him sit. Walk through the doorway and then release him, but be consistent, don't allow him to get away with any alpha dog behavior otherwise it will become a habit. When Max was a puppy, I taught him to 'Sit' and 'Wait' so that I could walk through doorways or go up or down the stairs first. He now does this automatically and it's so sweet to watch. If you'd like to learn more about training your puppy just follow the link. Height always reinforces the position of the alpha male. If your Cocker Spaniel is challenging for the role of top dog, you must make sure he is always positioned lower than you, ie., on the floor. Don't lie on the floor with your Cocker. You will be confirming (in his eyes at least) that he is your equal. (This only applies if your Cocker is becoming 'willful' otherwise it's fine to lie around with our pets). If your Cocker is showing dominant behaviors or vying for the role of alpha dog, don't let him up on the furniture unless he's invited. You must be the one who invites him up and the one who tells him to get off. Similarly, don't allow him to sleep on your bed. In the canine world, the alpha dog always gets to sleep in the best, most comfortable spot. Your bed is where you (the alpha dog) sleeps. If your pet claims your bed as his, move him! If you prefer him near you at night, you could allow him to sleep on the floor, by the side of your bed, but in his own bed or crate. If you simply can't bear to sleep without allowing him on the bed, you might want to let him to sleep at the foot of your bed. Don't let him to sleep on your pillow and never allow him to come up onto the bed uninvited - he should be there at your request and should leave when you ask. You might find this (controversial) article on sleeping dogs interesting. It considers whether it's safe to allow our dogs to sleep in or on our beds and offers arguments both for and against. At the end of the day though, I believe it comes down purely to personal choice based on the temperament of your dog. When dogs make eye contact with an alpha dog, the lower-ranking of the two will always look away first. In the dog world a stare is a challenge, so a weaker dog's natural instinct will be to look away, unless he's wants to challenge the alpha dog for his position. So when a human stares at a dog it's possible that there may be situations where the dog could view this as confrontation. If the dog is dominant and is not well-trained, if he feels threatened, he may stare back at you and begin to growl and it may escalate to further aggressive alpha dog behavior. If the dog is submissive he will back down either by looking away, moving away, or laying down, or he may roll over or pee himself. These submissive behaviors are intended to show the alpha dog that he's harmless and isn't being challenged. I've heard conflicting advice about eye contact with dogs. Some say 'Never look a dog in the eye' and others have said 'Always look a dog in the eye'. However, for what it's worth, the following is my view on the subject. It all depends on the circumstances and the dog you're dealing with. I believe you can safely make eye contact with your dog. 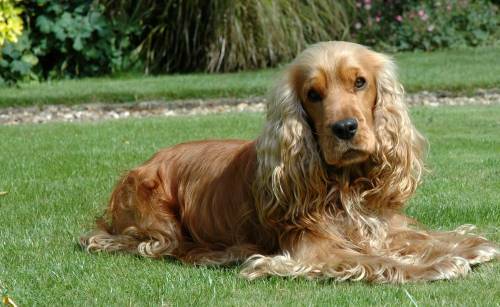 For example, when your Cocker Spaniel looks at you with those big brown eyes, you just know he adores you and it's safe to return the eye contact. There may be times when you give your dog a command and he fails to follow it (as they sometimes do!). Give him a 'firm' look so that he understands that you mean business - if you're top dog in the home, (as you should be) he'll respond fairly quickly! I do acknowledge though that there are times when you should never stare into a dog's eyes, and where eye contact has already been established, you should back down immediately. The chances are it won't arise with your own Cocker, but a strangers dog. You'll know it when you see it, if you haven't already. The dog will give you a 'glassy stare', he may lower his head slightly, and may stand very still. He may curl his lip and begin to growl. If you see these warning signs, back off - quickly. Break eye contact and look away. That's the safest thing you can do at this time. If the problems was your own dog, when things have calmed down, take the time to work out exactly what caused him to behave in that way and try to work out how to avoid it happening a second time. If it does happen again, I seriously recommend you work with an animal behavioral therapist to try and resolve the problem. It's important to realize that the majority of Cocker Spaniels will never display this sort of behavior, but it's best to know how to deal with it should it ever arise. I often get emails from worried owners whose dogs are becoming out of control. Their 'manners' have slipped and they're not responding to simple obedience commands such as 'sit' or 'down'. Some are even edging towards being aggressive! Don't treat your dog like a human; he's not, he's an animal; he's a dog and doesn't have human traits. There's no such thing as a free lunch. Ask him to 'Sit' or lie 'Down' before you feed him, give him a treat, take him for a walk, stroke, or play with him; make him work for everything! When anyone comes to visit, don't let him greet them before you do; the pack leader always greets visitors first. If he gets excited and bolts for the door, move him away and ask him to sit quietly. Open the door and greet your visitor. If he's still sitting quietly, you can release him and allow him to say hello to your guest. You may occasionally find your pet blocking your path. If you do, don't walk around him or step over him. Make him move! In a pack, the alpha dog would nudge a lower-ranking member out of his way. If the lower-ranking dog protests, he would be challenging the authority of his leader by trying to guard the space he currently occupies. I use the words, 'Move Please' and Max has learned that he needs to get up and move out of my way. He's now learned not to nap in doorways! Don't make a fuss of your Cocker when you re-enter a room. It's not what the alpha dog would do. Instead, ignore him for a few minutes. If you find yourself in a position where you need to re-establish your role as pack leader, I don't recommend that you hug or cuddle your Cocker while you're re-establishing control as there's a chance he may see any such contact as a direct challenge. Never, ever, allow your dog to mouth anyone's hands, skin, or clothing - even in play! Puppies do this when they're playing with their siblings and are taught bite inhibition by their mother. Puppy biting is easily managed as long as it's tackled while he's still a young pup. Don't allow your Cocker to initiate any form of play. You decide what and when he plays. You also decide when it's time to end your dog's playtime. Never play tug-of-war with your dog without first understanding the rules of play. Don't allow your pet to get away with attention-seeking behavior such as barking, whining or pawing. He may do this when he wants you to play with him or pet him. If you give in to his subtle 'demands' every single time, he may come to see you as weak and view himself as the strongest pack member and challenge you for the alpha dog role. Besides, it can become very annoying! Make sure your Cocker fully understands and obeys the 'Drop It' command to help reinforce you as the top dog. You should be able to take anything from your dog's mouth, easily and safely. Most Of All, Be Confident! Dogs are sensitive to human emotions; they know when we feel threatened, frightened, insecure, anxious nervous, happy or sad. If you're feeling frustrated and angry about your Cocker's behavior, he'll know, so chill! Alpha dogs are pack leaders, they're calm, confident and strong, and you need to behave in the same way. By following the above guidelines confidently and consistently your dog will begin to understand his place in your pack AND HIS MANNERS WILL IMPROVE! Be confident, walk tall and let your dog see your positive body language - you are the alpha dog! There's a lot of talk at the moment questioning the concept of the alpha dog. The argument is that this role existed in the wolf, but that it no longer exists in our domesticated dogs. Bristol University are convinced that "using dominance to explain (aggressive) dog behaviour is old hat". They refer to a paper "Dominance in Domestic Dogs - Useful Construct or Bad Habit?" which suggests that dogs aren't motivated by their role or hierarchy in a pack environment. That may well be true, but for me and many others, the jury's still out. Dogs enjoy living in a pack (read family) and just like in any family there must be rules. If your Cocker Spaniel wants to live with (and fit into) your pack he must learn and follow the rules. If you don't teach him what those rules are, he'll make up his own, and that's when behavioral issues arise. Even if the concept of the 'alpha role' is eventually blown out of the water, I firmly believe that if you follow the above advice you will have a very well-mannered Cocker Spaniel - and that can't be too bad, can it?